In accordance with a number of other general circulation model experiments, the coupled atmosphere-ocean-GCM ECHAM4+OPYC3 simulates increasing upper air storm track activity over the east Atlantic and Western Europe with rising greenhouse gas forcing. 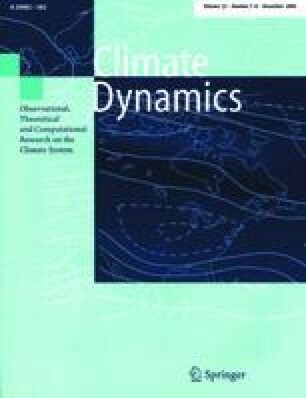 This paper addresses the question to what extent this change is attributable to the variable north Atlantic Oscillation (NAO), which is closely related to the intensity of the Atlantic storm track’s extension into Europe. The NAO index, which is based on sea level pressure fluctuations over the north Atlantic in the 300-y control run of this model, only shows a moderate increase within the 240-y scenario run, so that its long-term trend does not exceed the variability of the control climate before the end of the simulation. In contrast, the steadily growing storm track activity over northwestern Europe already surpasses the standard deviation defined from the control run after about 160 y. This effect is associated with a change of the NAO pattern. A determination of the centres of action for subsequent 10-y periods based on empirical orthogonal functions shows a systematic northeastward shift of the NAO’s northern variability centre from a position close to the east coast of Greenland, where it is also located in the control run, to the Norwegian Sea.